If you were to draw up a blueprint for a successful music career, the final plans couldn’t help but resemble Newsboys’ trajectory. They’ve defined Christian music for more than two decades, only to blow up expectations as they’ve recreated themselves again and again. Impossible to pin down, these musical shapeshifters move fluidly between rock and pop, worship and dance, to the delight of their legion of fans. Their live shows exhibit a kind of energy that, if it could be bottled, would power entire cities. Along the way, they’ve sold more than 8 million units and amassed eight Gold® certifications, 33 #1 radio hits, four GRAMMY® nominations, two American Music Award nominations and taken home multiple Dove Awards. In addition, their chart-topping, Platinum®-certified single, “God’s Not Dead,” inspired Pure Flix’s 2014 hit film of the same name. While the recognition for all their hard work is nice, the band isn’t in it for the accolades. 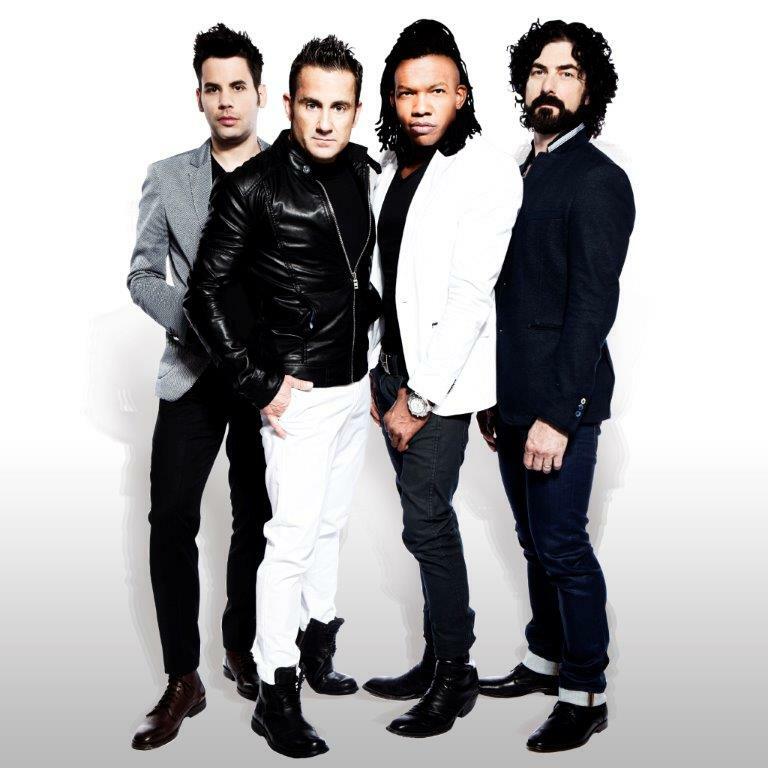 Instead, lead vocalist Michael Tait, guitarist Jody Davis, keyboardist Jeff Frankenstein and drummer Duncan Phillips do what they do out of love: love for God, love for their fans and love for the simple act of making music. Love is an emotion they believe we need more of in this increasingly dark world. They’re so passionate about the idea that they titled their new album Love Riot. For inspiration for their latest musical endeavor, they looked around at the good that’s already being done, people who are shining examples of love both in their own backyard and around the world. The album celebrates those selfless acts, while also aiming to inspire the Church to refocus on this cornerstone of our faith. “What makes Christianity different than every other faith is that it’s built on love,” Phillips reminds. Love Riot hopes to change that. In search of just the right sound for this new project, Newsboys ventured west, turning to Mark Needham (Imagine Dragons, The Killers, Chris Isaak) and Zach Hall (Five Knives) for a big sonic approach. Recording in a castle overlooking Los Angeles’ Griffith Park, Needham pulled things out of the band they didn’t even know were there, taking tracks from good to great to extraordinary. To round out the project, they relied on Full Circle Music’s GRAMMY®-winning producer Seth Mosley and Mike X O’Connor. The Nashville-based team has an innate understanding of what makes a pop song work. Additionally, Mosley’s longtime relationship with the band meant he had a keen grasp on each member’s unique gifts and how to make the most of what they brought to the table. In keeping with such mega worship anthems as “God’s Not Dead” and “We Believe”—the kinds of songs that often turn Newsboys’ concerts into all-out worship services—Love Riot features its own share of equally moving moments. The band’s subtle, yet powerful take on “No Longer Slaves”—introduced last year by Bethel Music—and “You Hold It All (Every Mountain),” a declarative proclamation of God’s power, are sure to find deep resonance with fans. The intimate approach of “Guilty” gives pause for reflection, exploring our current culture’s practice of rewarding bad behavior. The message is a perfect fit for the film sequel God’s Not Dead 2, due this spring from Pure Flix. When the band filmed an on-screen cameo the first time around, they admit they had no idea what to expect, but this time they were ready, fully understanding the potential films have to share a message in a way that differs from a Newsboys concert. The impact of the film franchise has been so great that Newsboys have created the upcoming “God’s Not Dead” conferences. They’re also championing religious liberty causes in a more proactive way—shining a light on individual instances of censorship, where Christians are asked to hide their light under a bushel or are being forcibly silenced. Why does the band feel it’s so important to speak up now? “Because no one’s talking about it,” is Tait’s matter-of-fact reply. Not that they plan to make a practice out of pointing fingers, but to “impact the world by bringing a straight and true message delivered with love,” Phillips explains. Of course, creating faith-filled music will always be their first love and main focus. They continue to keep up a grueling touring schedule and show no signs of slowing down. More than two decades in, Newsboys are hungrier than ever before, and they’re just getting started. They’re men on a mission. The goal? To change the world. Let the Love Riot begin!